On this 15th day of February, Studio Canal are releasing three more titles in their wicked Blu-ray catalogue collection. We previously reviewed their Deer Hunter and Elephant Man releases and found them to be high qual in every way. 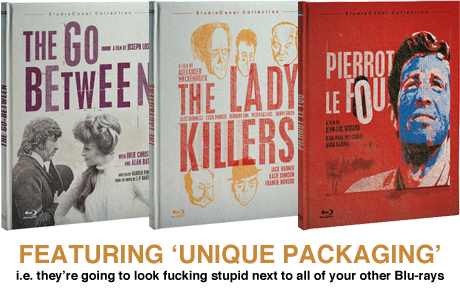 The Go-Between, The Lady Killers and Pierrot Le Fou are no different. Obviously, there’s nothing more that needs to be said about the films themselves.